Pay per click advertising is completely dictated by results. Results. Results. Results. 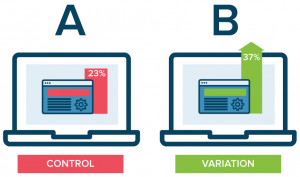 A/B testing is an extremely effective way to do this, by varying one variable between two identical campaigns to see how that changed variable affects the performance of the advert. The problem lies in what variable/s should you change in order to maximize your campaign’s performance, whilst utilizing your budget the most? Here are some types of tests you could look to conduct in PPC. Keywords aid in targeting your PPC campaign at the exact market you want. There is a certain argument that the best way to gain traffic is through bidding for brand names (which is allowed in PPC). Not only are brand names contextual, they also help ‘steal’ some traffic away from your competitors organically. Therefore, it is a win-win situation. On the other hand, the more common root for keywords is to choose contextual keywords. Keywords that relate to what you are advertising, and the topic you are discussing in your campaign. It is impossible to determine whether bidding on brand names versus contextual keywords will be better for your campaign unless A/B tested. The cost per click you choose to adopt for your PPC campaign plays an important role for a PPC campaign. It influences what keywords your search advert appears for, what position the advert is in the paid search results, the click through rate of the advert, quality of traffic and so on. It is generally normal for advertisers to start with a low CPC and increase their CPC if the performance of the PPC campaign does not reflect the financial investment in it. Instead, it would be more beneficial to run the campaign with a low CPC and then a high CPC and compare and contrast the results, instead of incremental increases until a performance you are happy with. It is common for advertisers to understand the type of people they want their adverts to appear. But, with regards to their age and location, this can sometimes be a bit vague. For example, an advert about flowers will likely get more of a conversion from someone searching flowers in sunny weather, potentially at an age where people are most likely to get married than in a cold country by someone very young or old. For this reason, it is a good idea to compare and contrast how different ages and locations affect the results of your PPC campaign. Micropayments – The Future of the Internet?